You know how it is when your dog looks at you with those soulful eyes? What if those eyes could no longer see? Dog eye health is often taken for granted when it comes to canine health care, which is a shame as it isn’t hard to maintain the health of your dog’s eyes and ensure he keeps his vision into old age. Eye problems in a dog may be breed specific. Certain breeds can be prone to certain eye conditions. For example Collies may have a hereditary condition known as Collie Eye Anomaly (CEA). This eye condition can cause blindness. Some Collies can be carriers of the disease without displaying symptoms themselves. There are two similar dog eye health disorders that affect the eyelids in certain breeds. Entropion is caused by the eyelid turning in, whereas Ectropion is caused by the eyelid turning out. Both conditions cause irritation of the eye. Breeds that are susceptible to one or the other of these disorders include Cocker Spaniels, Rottweilers, Poodles, Bulldogs and Labradors. Cataracts are common in dogs and are most likely an inherited condition. Cataracts cause a film to form over the lens of the eye, which worsens over time. Cataracts can be removed surgically with good results. The earlier they are treated, the better the result and the less chance of your dog’s vision being affected. Glaucoma is caused by a build-up of fluid in the eye itself which causes pressure within the eye, potentially damaging the optic nerve and leading to blindness. Glaucoma is a dog eye health issue which is not easy to spot. You may notice a slight redness in the eye or a slight cloudiness. Glaucoma can be treated with eye drops or surgery, but there is no guarantee that this will improve your dog’s sight. Progressive Retinal Atrophy as the name implies, is a gradual deterioration of the retina. Although this causes no discomfort to your dog, blindness will inevitably result. One of the early symptoms of Progressive Retinal Atrophy is difficulty seeing in the dark. There are test for this disease and it is important to rule it out before allowing your dog to breed, as the condition is inherited. Dog eye health problems can also simply be caused by an injury or accident. If your dog has an injury to his eyes or if something gets into his eye causing irritation, it’s best to put a damp cloth over the eye to prevent further irritation and take your dog to the vet immediately. When it comes to dog eye health, prevention is paramount. 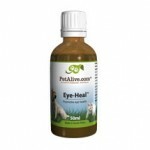 There is a natural product called Eye-Heal from Native Remedies which supports dog eye health and clear vision and prevents a lot of eye problems in your dog, including dry eye. Eye-Heal also promotes healthy conjunctiva. Dog eye health is giving your dog the gift of healthy sight for life. My dog is a 12 year old fox terrior. He is as” fit as a fiddle”, eats anything, and bounces around like a puppy. However, I would like to gradually change his diet, and start using products that might help prevent him from going blind and death in old age. Could you advise me on such products and further would it harm him to use eye-heal even if there is nothing wrong with his eyes. Thankyou.–KEVIN.